BOSS WL-20 Wireless System with the Katana-100 guitar amp. When working with music gear, the simplest approach usually provides the most satisfying and inspiring experience. Unfortunately, going wireless and maintaining great tone has historically been rife with complications and expense, putting untethered freedom out of the reach of the average musician. But BOSS has changed all that with the affordable WL series, an all-new product line that makes it easy and convenient for every musician to enjoy wireless independence wherever they play. Sounds pretty cool, right? Read on to learn more about this latest game changer from BOSS and discover which WL wireless system is right for you. From the beginning, all BOSS products have been designed to provide great sound, easy operation, and rugged “always works” reliability for every level of musician. The WL series is no different, delivering the legendary performance players have come to expect from BOSS over the last four-plus decades. A standout feature of the WL series is its plug-and-play operation, which takes all the guesswork out of setting up the wireless connection. The optimum connection is set automatically by docking the transmitter and receiver for just a few seconds, eliminating the fussy channel selection and manual fine-tuning needed with other systems. BOSS WL-series wireless systems:WL-20, WL-20L, and WL-50 (left to right). Working in the 2.4 GHz frequency band, a WL system seeks out the clearest of 14 different channels for rock-solid audio performance with absolutely no drop-outs. At that point, communication is established at two frequencies in the channel, providing an instant fallback in case any interference is introduced. Going even further, BOSS employs a number of unique underlying technologies to ensure connection stability at all times. The best news of all is that these high-tech details are completely invisible to you—all you have to do is plug in and enjoy the cable-free liberation that wireless provides. And isn’t that the way it should be? 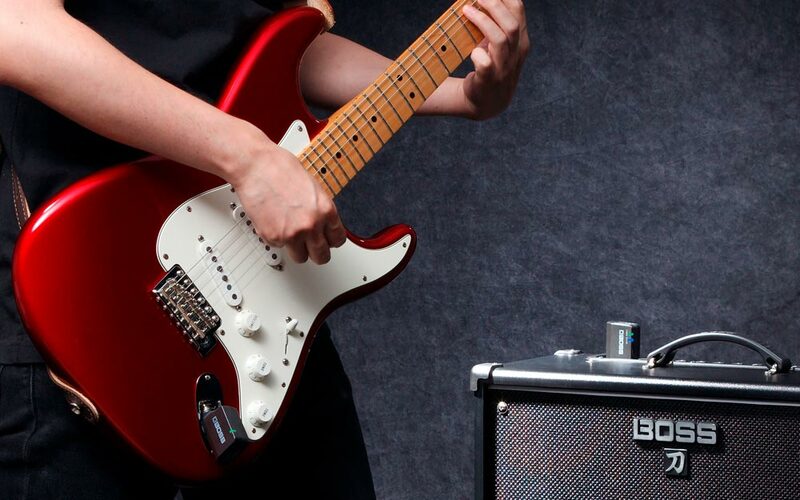 The compact transmitter in a WL-series system is compatible with various electric guitar types. Easy operation is great, but it means nothing if the sound isn’t any good. But don’t worry, the WL series sounds more than good—it sounds exceptional. Thanks to the many real-time BOSS innovations going on under the hood, the WL series’ top-level audio performance remains ultra-stable and perfectly consistent, just like using a premium instrument cable. When you plug in with your BOSS “virtual cable,” you’ll find that your tone is round, clear, and punchy, and perhaps even a little better than that traditional cable tether you’ve been using all these years. The dynamic range is an impressive 110 dB, providing ultra-clear and quiet performance with zero compression. Just as importantly, the WL series feels great to play, with class-leading 2.3 ms latency for lightning-fast performance. In real-world usage, this level of latency is basically imperceptible—the equivalent delay of hearing sound less than three feet/one meter away from your amp. Other wireless systems utilize preset channel assignments that restrict access to unused channels. A huge benefit of BOSS’s auto-connecting wireless technology is that it searches for all unused channels, maximizing the available connection options. Up to 14 BOSS wireless systems can be used simultaneously in one space, allowing you and all your bandmates to enjoy easy wireless freedom at the same time. Note that certain environmental conditions may limit bandwidth and affect the actual number of simultaneous systems available. But in typical small groups, you shouldn’t encounter any problems in the most common jamming, rehearsal, and gig situations. 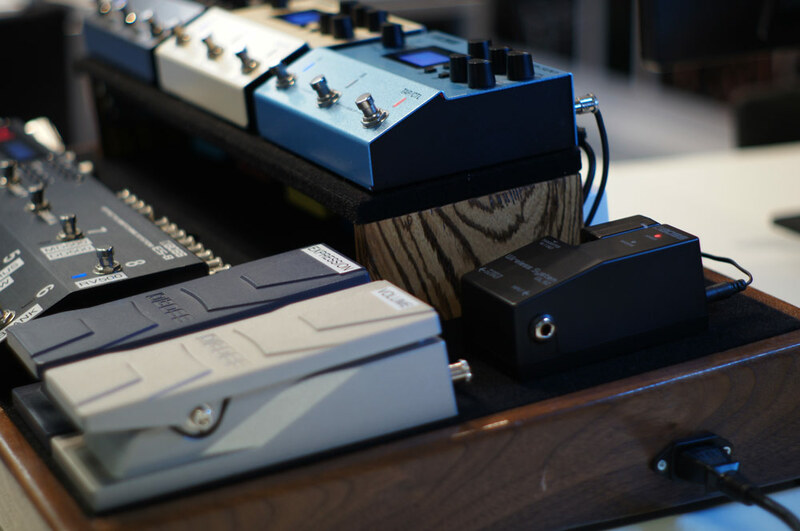 The BOSS WL series works great with electronic instruments like Roland’s Aerophone (left), acoustic-electric guitars, keytars, synths, drum machines, and more. When playing a guitar or bass with passive pickups (the type found in most instruments), the cable you use actually has a subtle effect on your overall tone. This effect is heard as a roll-off in the treble frequencies and is caused by the passive instrument’s high output impedance and its interaction with the electronic capacitance characteristics of the materials used in the cable. This capacitive effect is magnified with cable length, becoming more and more pronounced as the length is increased. Most players have become used to cable capacitance and the slight warming effect it has on their tone. To reproduce this, two WL-series products include integrated cable tone simulation. BOSS has carefully analyzed a wide variety instrument cables and tuned the simulation to replicate the average of the best tonal characteristics among them. The WL series includes the WL-50, a stompbox-size wireless system that fits easily on any pedalboard. Each WL-series system includes a WL-T transmitter, which comes equipped with a built-in rechargeable battery that provides up to 12 hours of continuous playing time. If you leave the transmitter plugged into your instrument when taking a break, it automatically goes to sleep after about an hour to conserve the charge. When you're ready to play again, simply pick up your instrument and play for a second or two to wake the transmitter. The WL-T is also available separately, allowing you to purchase a spare if your original transmitter is lost or damaged. Which BOSS Wireless System is Right for Me? For most electric guitarists and bassists, the WL-20 is the best choice. It features the built-in cable-tone simulation mentioned earlier, delivering the slightly warm tone you’re used to hearing with a standard cable. Amazingly compact and simple to use, the WL-20 consists of a transmitter that plugs into your instrument and a matching receiver that plugs into a pedal or amp. To establish the wireless connection, just dock the two components together for about 10 seconds and you're ready to rock! When docked, the built-in batteries in the transmitter and receiver can be charged together with a standard USB adaptor (5 V/500 mA or higher), the same type used with smartphones and tablets. The transmitter can also be charged separately, and a micro USB cable is included for charging. BOSS WL-20L Wireless System. In this image, the transmitter and receiver are docked for charging and wireless connection setup. The WL-20L model is identical to the WL-20, with the exception that it does not include cable tone simulation. This makes it the best choice for instruments with a low-impedance output, as cable capacitance has little or no effect on the tone with this type of instrument. How do you know if you have a low-impedance output? In most cases, it’s pretty simple: if your instrument has an onboard battery or requires power from an external source, then its output is nearly always low impedance. Common instruments like this would include an acoustic/electric guitar with an onboard preamp, a guitar or bass with active pickups, or a line-level device like a keytar or Roland’s Aerophone digital wind instrument. By the way, the WL-20L also works fine with passive pickups—the sound will just be a little brighter than the WL-20. The tonal differences between the two are actually quite subtle, and you might even find you prefer the WL-20L's sound. In effect, it’s basically like adding a high-quality onboard signal buffer to your passive instrument, which many players like to do. BOSS WL-50 Wireless System. In the right image, you can how conveniently the transmitter connects to the receiver’s dock for charging and wireless setup without adding any height to the receiver. 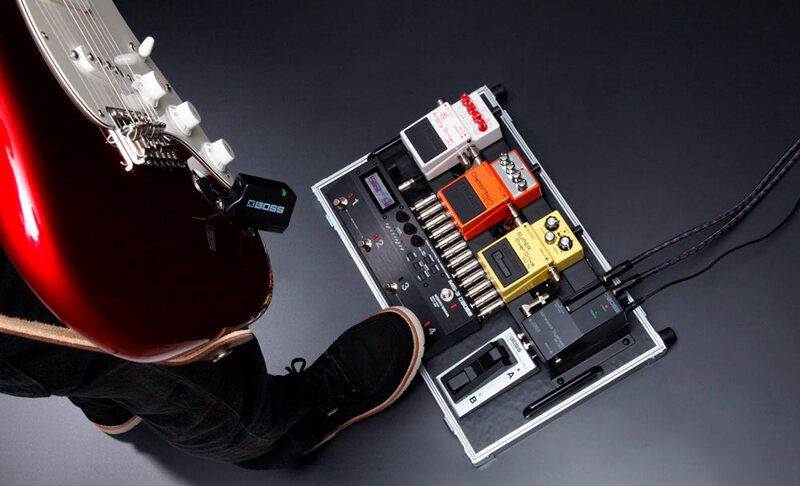 With its stompbox-size footprint, the WL-50 Wireless System is ideally suited for pedalboards. It’s about the same size and height as a standard BOSS compact pedal, so it fits easily alongside the other stomps on your board. Just place it at the beginning of your effects chain and connect the receiver’s output to the first pedal. The receiver even includes a standard ¼-inch input jack, so you can always plug in with a regular guitar cable if you ever need to. Since the WL-50 receiver is designed to be mounted on the floor, it features a sophisticated diversity antenna system. This maintains a secure and stable wireless connection no matter where your pedalboard is set up. A transmitter dock is built into the WL-50 receiver, and it’s used for charging and establishing the wireless connection. Like the WL-20/WL-20L, the optimum connection is set up in seconds. Selectable long and short cable tone simulation options are also available, along with a bypass mode for turning off the simulation. The WL-50 receiver is powered via a PSA-series adapter or AA batteries. With adapter power, the receiver’s DC output can distribute power to one or more pedals. 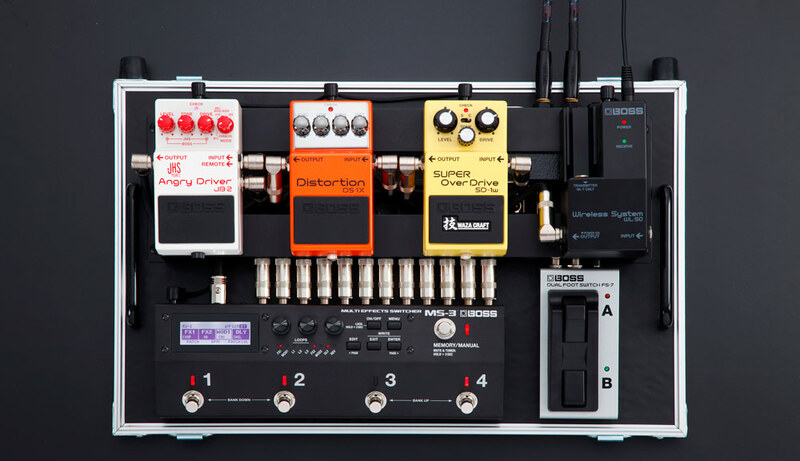 The BOSS WL-50 Wireless System mounts easily right alongside other stompboxes on any pedalboard. The rear panel of the WL-50 receiver includes selectable cable tone simulation options and a DC output for distributing power to additional pedals. With the BOSS WL series, wireless freedom is now easily accessible to any musician who plays an electric instrument. To find out more about these powerful and affordable new BOSS wireless systems, visit the BOSS website. The innovative BOSS wireless technology in the WL series is also found in the Katana-Air, a fully wireless battery-powered guitar amp designed for home playing and jamming with friends. Equipped with the same sound-shaping features found in the Katana Version 2 stage amplifiers, the Katana-Air delivers premium tones for all styles of music. Five channels provide a wide range of sounds, and there’s also integrated access to over 50 BOSS effects. It’s even possible to play along with audio streamed via Bluetooth® from an iOS or Android smartphone and remotely edit tones and effects from the dedicated BOSS Tone Studio app.